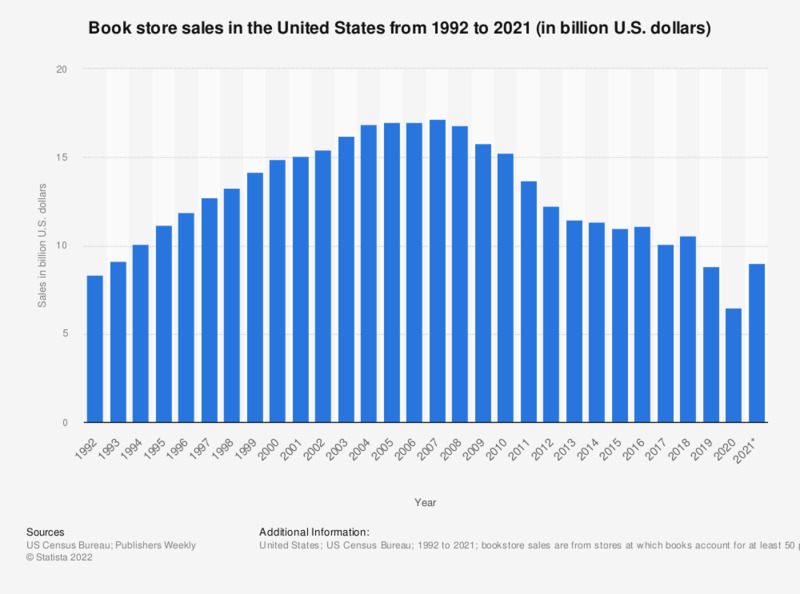 This timeline depicts book store sales in the United States from 1992 to 2018. In 2018, U.S. book store sales came to about 10.28 billion U.S. dollars down from 15.24 billion U.S. dollars in 2010. All numbers are estimates and based on data from the Annual Retail Trade Survey. Estimates have been adjusted using final results of the 2007 Economic Census. Estimates have not been adjusted for price changes. Additional information on confidentiality protection, sampling error, nonsampling error, sample design, and definitions can be found here. Estimated measures of sample variability can be found here.